Home › cystic fibrosis › Great Strides 2012 – the walk is this weekend! Great Strides 2012 – the walk is this weekend! Note: we were asked for our t-shirt sizes late this year. We don’t know if we’l be getting t-shirts this year. We’ll find out on Sunday morning if we have new t-shirts for this year. If you have a t-shirt from last year, please wear it. 1pm: Awards ceremony – top fundraisers get prizes! Mark your submissions clearly with “Team Katie” to make sure they are reflected in our team’s total! 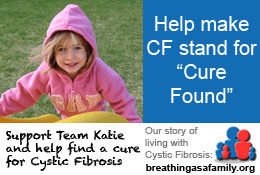 Thanks for your commitment to help us make CF mean Cure Found! See all of you on Sunday!